“Raising a flag over the Reichstag” – the famous photograph by Yevgeny Khaldei, taken on May 2, 1945. 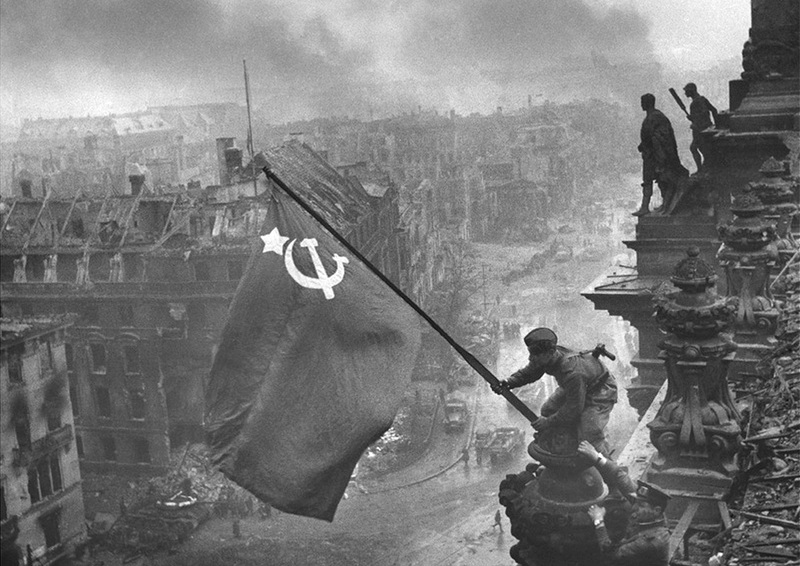 The photo shows Soviet soldiers raising the flag of the Soviet Union on top of the German Reichstag building following the Battle of Berlin. The moment was actually a re-enactment of an earlier flag-raising, and the photo was embroiled in controversy over the identities of the soldiers, the photographer, and some significant photo editing. This must be the original (unretouched) version? The soldier on the right has two wristwatches (obviously ‘liberated’) so the authorities removed one of the watches.